Funny and Creative Doormats that Say it All! I absolutely LOVE to design funny, cool and sometimes rude saying doormats! I think they are hilarious! They also make awesome housewarming gift ideas in my opinion. Here you will find my most favorites! Funny Crying Face Drawing Doormat that says GO AWAY! The doormat is usually the first thing visitors see when they arrive at your doorstep…. 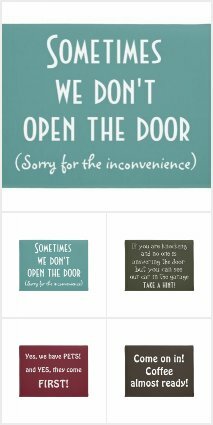 Sometimes we are jut not up for a visit… Or maybe we are… Whatever your mood is on a certain day, let your guests know beforehand… with your doormat! To be honest this is probably one of the most truthful doormats out there! We are not a hotel! We want to know what you are doing here and what do you want! You are dead! But you made it to Heaven! Yay you!! Cool Doormat for Coffee Lovers! This fun coffee color design doormat will let your guests know beforehand there will be a nice and hot cup of coffee waiting for them! Great housewarming gift idea, don’t you think? This rude hot pink color design doormat will always greet your visitors with a truthful message…. If you haven’t called before coming, don’t even thing about ringing the bell! “All Aliens Welcome” Cool and Creative Doormat! Let your visitors know you don’t discriminate against anyone! Alien or not! If you come in peace, you can come in!